This deal has been extended for one more day – through the end of today (4/29)! The Children’s Place is offering an additional 40% off your entire purchase plus FREE shipping. Just use The Children’s Place coupon code BIGSALE3 at checkout. This is a RARE discount. The best discount we usually see is 30% off. Definitely take advantage of this one. 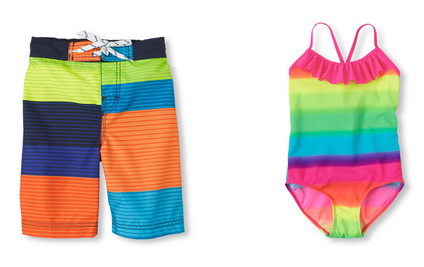 This is a great time to grab kids’ swimsuits for the summer. They have Girl’s One-Piece Swimsuits for $10.79 or Boy’s Swim Trunks for $10.20 after coupon code. You can also shop the Clearance Section for some amazing deals. For example, you can get Girl’s Fancy Graphic Tees like the one pictured above for just $3.59 after coupon code (reg. $12.95). Or get Boy’s Argyle Vests for $7.19 after coupon code (reg. $24.95). There are tons more great clearance buys like this. Let us know what you find! Hurry and shop The Children’s Place Sale before the end of today (4/29)!